All parents, grandparents, and caregivers with children age birth to two years old are welcome to join us every other Monday from 11:00 to 11:45 a.m. for a time of fellowship, encouragement, and singing favorite Sunday School songs. Friends and neighbors are welcome. Meet at the Nursery School entrance at 11:00 a.m. promptly so we all can enter as a group without disturbing the Nursery School. Questions? Please contact Deacon Diana Rodgers through the church office. 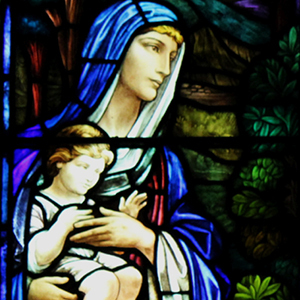 Photograph: Detail of an art glass window in the south transept of the Shadyside Presbyterian Church sanctuary, depicting Jesus blessing the children. Window designed by the Gorham Company of New York. Photo taken by Ellen L. Allston.